The digital computers that we employ today use coded software in the form of a sequence of operations (algorithms) to treat data which we input. In accordance with its programs, the computer calculates answers. The computer built by the ancient Greeks (about second to first century BC) used programming in the form of suitable gears to calculate answers to questions concerning the cosmos (primarily the solar system). It turns out that the motions of the bodies in the night sky are very complicated. Most of us today do not pay a lot of attention to the heavenly bodies. However many ancient peoples studied the night sky closely. In this endeavor they revealed a capacity for precise observations, fancy mathematics (and in the computer, precision technology). It was these mathematical relationships in the motions of important heavenly bodies that were programmed in the form of elaborate gears into the Antikythera Mechanism, built perhaps on the Mediterranean island of Rhodes about 100 BC. The solar system diagrams that we see in textbooks are entirely too uncomplicated. The Earth’s orbit is not circular, but elliptical and as a consequence the Earth moves faster during some seasons than others. The same holds for the Moon, its orbit is elliptical around the Earth and it takes a lot of years to bring the Moon back to any given starting position relative to the Earth. Apparently 19 solar years are close to 254 revolutions by the Moon around the Sun, while revolving about the Earth, which translates apparently into 235 lunar months. 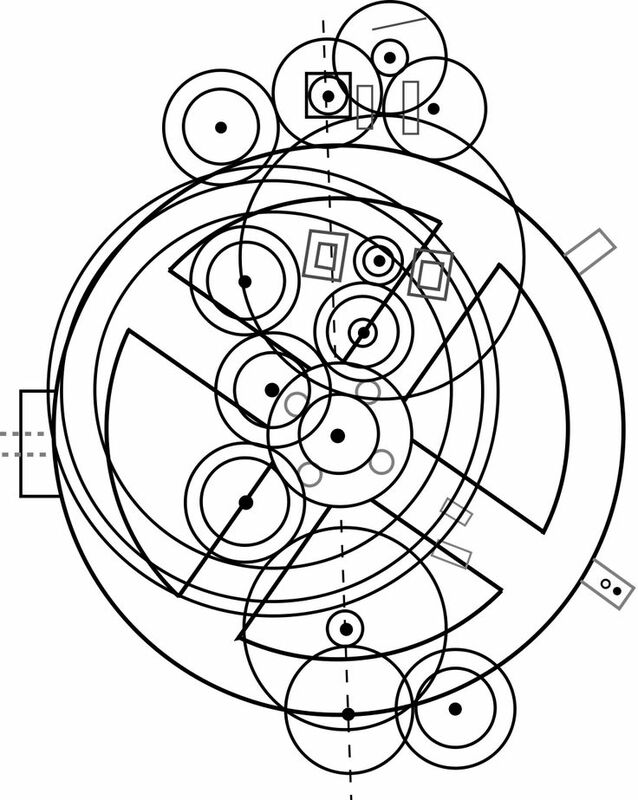 The problem for the designer of the Mechanism was “to find a period that is simultaneously a whole number of solar (tropical) years, a whole number of lunar months, and a whole number of days, and to find the best way to distribute the ordinary and intercalary [leap] years and the full and hollow months [normal length or of fewer days] within a cycle whose duration is this period.” (p. 81) However to accommodate the year’s real length of 365 and one quarter days, one must deal with a cycle of 4 x 19 = 76 years. The design features of this analog computer included pipes which allowed gears to have a common axis but different turning speeds, and toothed gears. The gears period of rotation relative to other gears depends upon the ratio of their tooth counts. The result is that “Applying gearwork to astronomical problems thus becomes a question of finding combinations of whole-number ratios that, when multiplied together, represent the ratios embedded in astronomical phenomena either exactly or as closely as possible.” (p. 205) This multiplication is achieved with compound gear trains involving engaged gears alternating with transfers of motion through pipes. The other phenomena for which the Mechanism is programmed include lunar and solar eclipses and the motion of five planets (Mercury, Venus, Mars, Jupiter and Saturn) relative to the constellations made up of stars. These values are all highly irregular since “the stars have a very slow eastward drift in position relative to … the points on the ecliptic [apparent circular path of the Sun]” (p. 112) This motion of precession, combined with the fact that the planets do not move on the same orbital planes as the Earth, means that the mathematical relationships between cycling of the planets and Earth are highly complicated. Thus for Jupiter to return to exactly the same position in space relative to Earth will take 427 years, for Venus 1151 years, Mercury 217 years, Saturn 265 years and Mars 284 years. Obviously the ancients did not observe entire cycles, but they were able to calculate these relationships and incorporate them into the gears pertaining to the planets. The system in the Mechanism also accommodated nonuniform motion of heavenly bodies by means of a pin-and-slot engagement of gears on slightly displaced axes. It was elliptical orbits which caused these bodies to proceed faster in some parts of the orbit than in others. The device also used other techniques for accommodating nonuniform motion. The capacity of ancient peoples to design and build such a sophisticated device, has greatly surprised many people. When Dr. Derek de Solla Price (1922-1983) carried out his research on the Mechanism in 1958 and 1961, he confided that what he observed was “like opening a pyramid and finding an atomic bomb.” (quoted by Jones p. 32). He expected something primitive but found advanced technology. Dr. Price added that the Greeks who built the Mechanism “were not far behind where we are now.” (p. 32 Jones) Indeed in the early 1960s in some universities, students used mechanical calculators for mathematical calculations. These were gear driven and often jammed. The Antikythera Mechanism may well have been fancier! Modern society has long considered that our capacity for abstract ideas and innovation are far superior to that of ancient peoples. This idea of progress, of course, is partly inspired by the idea of evolution and upward progress of mankind. The brain power to understand obscure mathematical relationships was obviously available long ago. And the technical know-how was there too. Dr. Jones suggests that the materials, tools and capabilities of the ancient artisans required to build such devices, were all readily available at that time. The gears were made from sheet metal of low-tin bronze (p. 233). He suspects, based on comparisons of ancient documents, that “there is enough evidence to suggest that complex and scientifically ambitious mechanisms were being made at least through the three centuries from about 100 BC to AD 200. “ (p. 242) Lastly he assures us that this machine was not unique in its time: “Common sense tells us that the Mechanism was not a prototype without antecedents. It was too complex, too miniaturized, too polished a production to be the very first of its kind.” (p. 231) So the ancients were not only intelligent, but also talented. The fact that such expertise was lost during the chaos of the dark ages, does not mean that subsequent generations or the ancients themselves were any less endowed with good brains. Dr. Chittick (1932-2016), a well-known speaker and author on creation, did not live to see this new publication concerning a famous ancient artifact. But we can appreciate that in his own book he declared that God created mankind with amazing talents. One of the ways that we are to use these talents is to study God’s creation, and although it was motivated by a pagan worldview, the Antikythera Mechanism definitely was the product of amazing studies of the heavens.